The Counterpoint Tactical Income Fund remains invested in US High Yield Corporate bonds. As of August 16, the BofA Merrill Lynch High Yield Bond Master II® Index yields 6.42% versus the April 30 level of 7.58%. From April 29 to present, WTI front month crude is almost unchanged from $45.92/barrel to $46.44 in live trading. Stability in commodities and risk assets in general has enabled solid returns from high yield. While our outlook does not determine our model’s position, the following thoughts should help illuminate a possible path forward. As of August 17, the Fed futures – implied probability of a 25 basis point rate hike sits at 26% for the September 21 Fed meeting. Likewise, the probability of at least one rate hike happening at the December meeting sits cumulatively at 53.5%. Given the backdrop of continued strong employment and inflation data as well as supportive stock prices, it is our opinion that the markets are underestimating the likelihood of rate increases for 2016 and beyond. 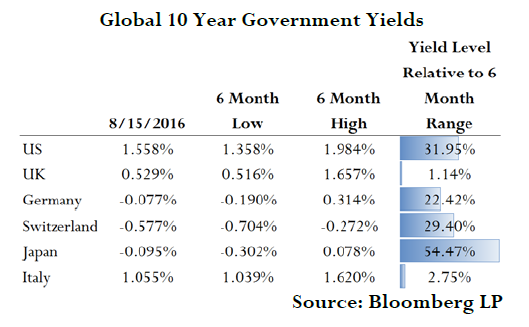 Global interest rates have minimally bounced off the fear-induced lows from Brexit despite the recent positive move experienced in high yield and risk assets. This is quite a surprise in the face of ongoing readouts of positive real economic data throughout the world. While new easing measures out of the United Kingdom are inspiring UK government yields to touch new historic lows, Eurozone yields remain under pressure due to continued support from the ECB and the Swiss National Bank. A recent proposal by the BOJ to formally reassess the effectiveness of current easing measures has triggered a recent selloff in JGBs, putting yield levels right in the middle of the six month range. Besides a well-supported stock market, we expect 3rd quarter GDP data in the US to come in stronger than the prior quarter on account of an expected inventory rebuild. Likewise, there have been no indications that payrolls data will alter the course of the multi-year trend. What is the prognosis for investors? If history is to repeat, a rising rate environment will likely continue to be supportive of stocks as well as high yielding debt, and provide a headwind to investors more heavily weighted in safe haven, agency, and investment grade corporate debt. While plenty of digital ink has been spilled over risk assets at historically expensive levels, there is no compelling argument that valuations should be anchored to some absolute level when considering the expected return available to fixed income participants today. There is reason to think that a “reset” to higher valuations must be accompanied by lower expected returns, or else that earnings must increase to compensate. However, a long-term upward reversal of commodity prices following declining capital expenditures will only reverse any earnings collapse. This should be long-term supportive of risk-asset prices, as only a substantial reversal in capital investment over a long period can alter this supply/price outcome. The Fund is still positioned in a “risk-on” manner. This has benefited the Fund because the market has experienced a significant post-Brexit recovery, rallying on positive news such as the July jobs report. Given the Fund had a beta targeting approximately 0.8 during this period, Fund returns clearly came from both its market exposure and its factor-based stock selection. Also, as we noted in the previous update, we are continuing to see a “return to normal” among our factors as oil and other commodity prices begin to stabilize. Factors which have historically performed well – but abruptly reversed during the first quarter of 2016 – have generally been performing well again. Although month-to-date factor returns have reverted adversely, this has not negatively impacted Fund results so far in August. Some of this can be explained by well-chosen stocks within these broad factor groups as well as factor interactions within our multi-factor approach to stock selection.